My friend (and hairstylist) recently asked me if I would consider making a trade... a cool birthday cake for her daughter in exchange for hair services. I jumped at the chance to do this fun project and was totally satisfied with getting my hair done rather than getting paid cash for it. I would totally do it again. 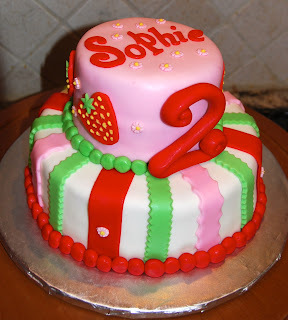 She was throwing a Strawberry Shortcake party for Sophie, and this design is similar to one that we found on Pinterest.com. It was a fun design to make, and I was really happy with the way it turned out. I hear it was a big hit at the party too!